Treatment of enamines with water and aqueous acid leads to the formation of aldehydes or ketones and secondary amines. Enamines undergo hydrolysis when treated with aqueous acid. This reaction id opposite to the formation of enamines which means that products are aldehydes or ketones and secondary amines. 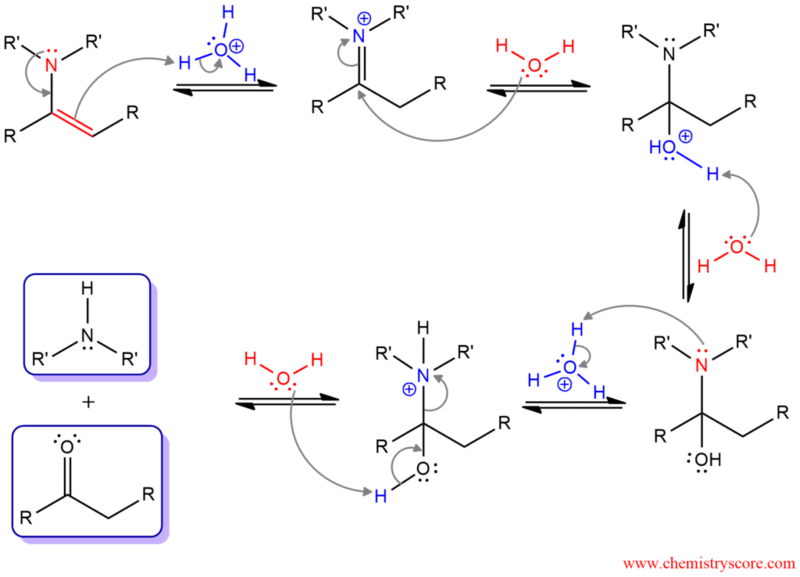 The intermediates involved in enamine hydrolysis are also the same as the intermediated involved in enamine formation but in reverse order. The mechanism of this reaction is exactly the reverse of the mechanism for the formation of enamines. In the first step, a lone pair of nitrogen forms a nitrogen-carbon double bond and the C-C double bond attacks hydrogen and becomes saturated. Hydrogen is added to α carbon (carbon bonded to nitrogen). Then, water function as a nucleophile and attacks the electrophilic carbonyl carbon. The positive charge is removed by deprotonation and the first stable intermediate called hemiaminal is formed. Protonation of nitrogen, followed by deprotonation od hydroxide leads to the formation of secondary amine and ketone.